ClearBridge research analysts lead company engagement and ESG integration. The firm’s analysts assign ESG ratings to every company in their coverage universe and use those ratings to drive engagement and track progress over time. The report, which is available here, showcases the firm’s efforts to promote sustainability through company engagement, proxy voting and raising awareness of ESG issues. This year’s report features companies such as Trex, Cott, Burberry and Home Depot. The report also includes an analysis of issues with direct ESG impacts, such as carbon emissions, responsible procurement of materials for electric vehicle batteries, plastic waste, gender diversity and sustainability disclosure standards. 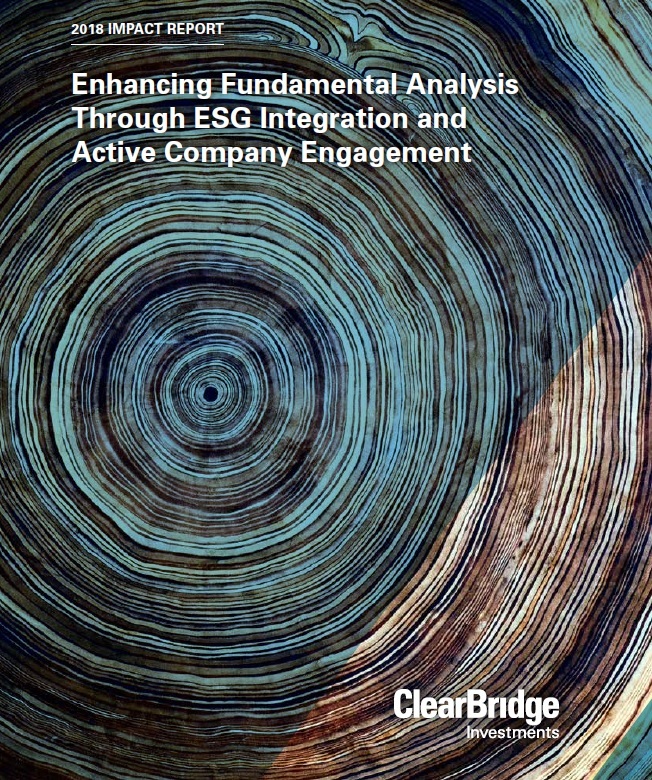 In addition, it details how ClearBridge utilizes the UN Sustainable Development Goals to provide a framework for measuring ESG impact on a broader level. ClearBridge has achieved high scores for its practices from the United Nations-supported Principles for Responsible Investing, a voluntary framework for institutional investors that commit to integrating ESG factors into their investment analysis and decision-making practices. With $141 billion in assets under management (AUM) as of Feb. 28, 2019, ClearBridge Investments is a leading global equity manager committed to delivering long-term results through active management. It has more than 200 employees spread across offices in New York, Baltimore, London, San Francisco and Wilmington, DE. ClearBridge focuses on three primary client objectives in its areas of proven expertise: high active share, income solutions and low volatility. Its strategies are available in separately managed accounts, mutual funds, collective investment funds as well as custom solutions, commingled vehicles and offshore funds. See more at https://www.clearbridge.com/about/company.html#sthash.ORm4Hx62.dpuf. Guided by a mission of Investing to Improve Lives™, Legg Mason, Inc. (NYSE:LM) helps investors globally achieve better financial outcomes by expanding choice across investment strategies, vehicles and investor access through independent investment managers with diverse expertise in equity, fixed income, alternative and liquidity investments. Legg Mason’s assets under management are $763 billion as of Feb. 28, 2019. To learn more, visit our website, our newsroom, or follow us on LinkedIn, Twitter, or Facebook.